NEW YORK CITY – Twenty-two "activists, advocates, altruists, aiders and abettors of jazz" in 20 U.S. cities were announced by the Jazz Journalists Association today as the organization's 2019 slate of Jazz Heroes. This year's Heroes, from Amherst, Massachusetts to Los Angeles, California, Seattle to South Florida, are all presenters, educators, non-profit administrators, public faces of grassroots organizations and in several cases active players sustaining and developing America's native-born music in their local communities and beyond. 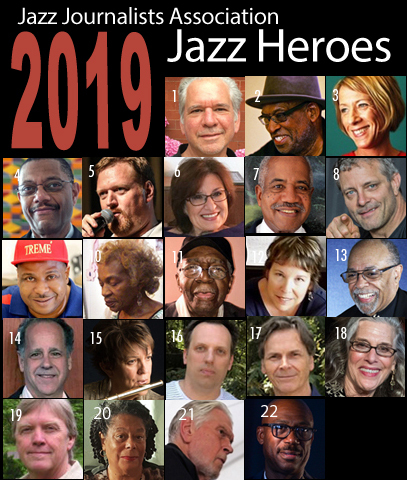 The complete list of honorees, with photo portraits and biographies, is posted at http://www.jjajazzawards.org/p/2019-jazz-heroes.html. Tenor saxophonist Paul Carr, founder of Washington D.C.'s Jazz Academy of Music; singer Suzanne Cloud, former executive director of Philadelphia's Jazz Bridge; Tallahassee-based pianist Bob Dogan, mentoring young players; flutist Holly Hofmann, founder of the UC San Diego Jazz Camp; trumpeter Steve Kenny, who's established series at St. Paul's Black Dog café and Minneapolis' Jazz Central Studio, and New Orleans brass band drummer Derrick Tabb, who established the Roots of Music after-school program, are among the musicians doing something extra that has resulted in their being feted by fans and friends in events co-hosted by the JJA at which they'll receive engraved statuettes. Harlem salon hostess Marjorie Eliot, Indianapolis Jazz Foundation and Indy Jazz Fest producer David Allee, executive director of Portland's Biamp PDX Jazz Festival Don Lucoff, and drummers John Bishop and Matt Jorgensen, who run Origin Records and launched the Ballard Jazz Festival are also named as Jazz Heroes. As JJA president Howard Mandel writes about South Florida Jazz Hero Dr. Joan Cartwright, Jazz Heroes are models for "anyone whose ambitions extend to being creative, innovative, expressive, self-realized, in the moment while communing with others, sharing experience, telling truth, and seeking beauty." The Jazz Journalists Association, a 501 (c) (3) professional organization of writers, photographers, videographers and broadcasters covering jazz, established its Jazz Heroes campaign in 2010, having since 2001 called the honorees members of the JJA "A Team." The JJA presents annual Jazz Awards for excellence in music and music journalism; nominees for 2019 Jazz Awards will be announced mid-April, with winners of those Awards revealed on or about May 1.